Home : Prairie Blog : Uncategorized : The Giving Garden Cookbook is on sale! 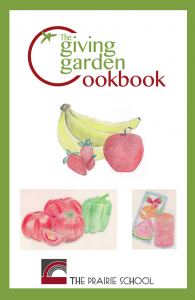 The Giving Garden Cookbook is on sale! The Giving Garden Cookbook is still on sale! With almost 150 recipes submitted from our Prairie community–students, faculty, administration, parents, and grandparents–this C.L.A.S.S. cookbook should be on your kitchen counter right now! Not to mention, of course, that all profits from the sale of this cookbook will go directly to the Racine County Food Bank. How can you get one of these delicious books? If you pre-ordered a cookbook(s) online and have already paid, you may pick up your cookbook(s) from Jane Raufus at the Welcome Desk. If you pre-ordered a cookbook(s) online and haven’t paid yet, please bring the exact amount of $20 per book (cash or check, made out to The Prairie School) to Barb Barth in the Upper School office. If you haven’t purchased a cookbook (or more than one–think of all those taste buds that could benefit from these incredible Prairie recipes! ), please also see Barb Barth in the Upper School office. Also, if you have an organization or business that would like to sell a set of cookbooks, please let us know. We would be more than happy to deliver the books to you to sell. Please don’t hesitate to contact us with questions.